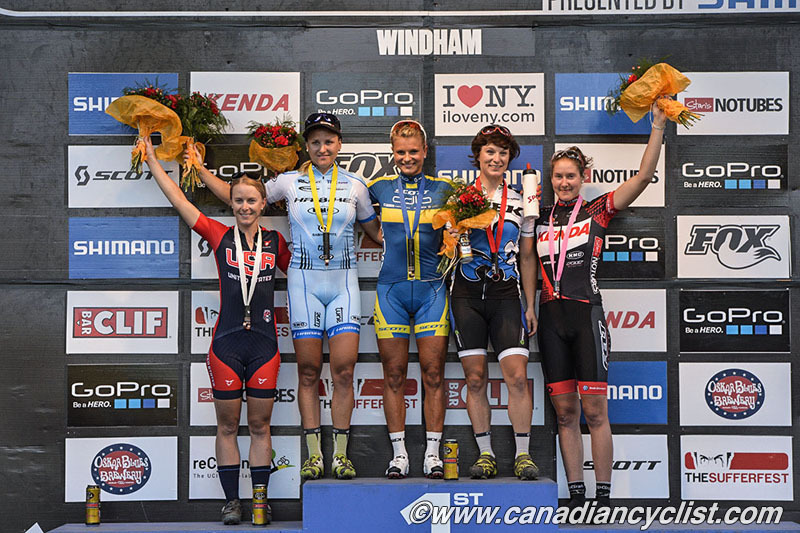 Jenny Rissveds (Scott-Odlo MTB Racing Team) and Andres Soto (MMR Bikes Pro Team) won their respective divisions at Round 5 of the World Cup Eliminator race at Windham, New York, on Friday. Cindy Montambault (Équipe du Québec) finished third in the women's final, a best-ever finish for a Canadian in an Eliminator final. The World Cup leaders kept their jerseys, with Kathrin Stirnemann (Sabine Spitz Haibike) holding the women's overall lead and Fabrice Mels (Salcano Alanya) the men's. The course mimicked that of Sunday's cross-country track, with grassy power climbs to start and then a lengthy descent to the finish. In between were a couple of small ledges that riders had to bunny-hop in order to maintain momentum. In the final, Rissveds - the number two qualifier - and top-qualifier Stirnemann went to the front early, eventually gapping Montambault and Chloe Woodruff (US National/Backcountry.com). Stirnemann tried valiantly to come around, but Rissveds had enough power to hang on for her first win of the year, and the fifth in her career. "It feels really good," said Rissveds of her win. "I had a tough start to the season, with the long travel to South Africa and after that to Australia. After Australia I felt bad in the body and the mind and everything. It feels good to finally take a victory here. It looks like I'm back and I'm happy about it." After the top-two rode away, Montambault was on her own, comfortably taking third, and receiving a hug from her husband Serge Desrosiers in reward for her efforts. "It feels awesome," related Montambault. "Anything can happen in Eliminators. It's not luck, but just working hard. When you start the qualifications it's heat by heat and you don't know what's happening. It's just a series of happenings. It was just fantastic today." The ninth-fastest qualifier, Montambault executed a nearly perfect plan to reach the final, basing her tactic on the second technical feature, a foot-high stone wall: "After the wall I was thinking to be first or second because after that there's no place to pass and I was first or second in every heat except the last." Andreane Lanthier-Nadeau (Rocky Mountain Factory Team) qualified fourth and won her opening heat, but appeared to run out of gas in the semi-final, eventually finishing eighth overall. Stirnemann now has mathematically won the World Cup with 225 points, since Rissveds, at 160 points, cannot surpass her total in the final round. Rissveds is tied on points with world champion Alexandra Engen (Ghost Factory), who did not race. Soto typically qualifies first, but hasn't been able to seal the deal in the heats. In the final he started well, getting the lead ahead of Fabrice Mels, Daniel Federspiel (Ötztal Scott Racing Team) and Simon Gegenheimer (Rose - Vaujany). Mels was passed by Gegenheimer near the end of the climbing portion, but Soto was on a mission and would not be caught, crossing the line to take his first win, touching off an ecstatic celebration. "I had very good qualifying this morning and I had good legs for the finals," explained the Argentinean winner. "This is a hard course and those in the final were all very good riders. I don't believe it." 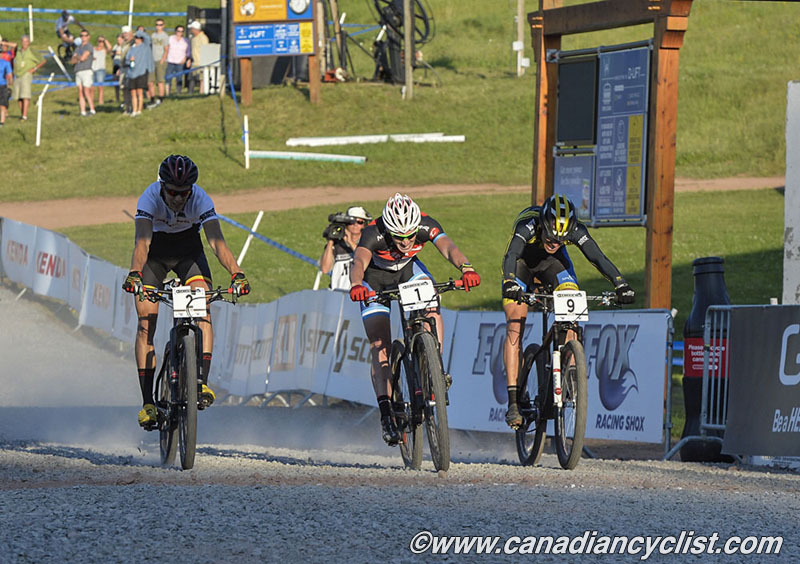 Canadian men have had a number of good results in Eliminator races this season, but the streak ran out in Windham, with none managing to move out of their first heat races. 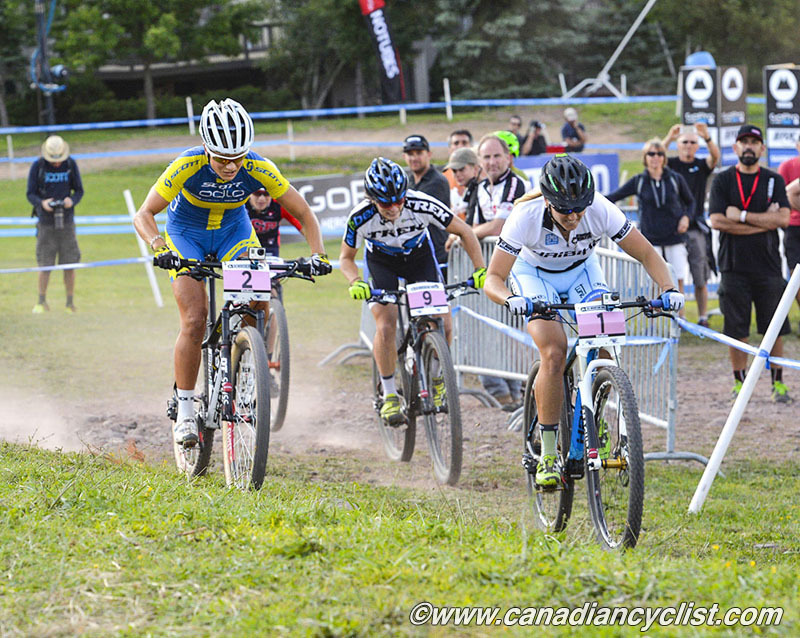 Samuel Tremblay (Canadian National Team) was in tough against Federspiel and Emil Lindgren (Giant Pro XC Team) and, despite riding in second position for a bit, was eventually caught. "I knew it could be possible (to advance) with those guys, but I was passed on the climb. I was in second so I could follow the wheel of the leader, and I pushed all I could to stay in second, but I wasn't able to." 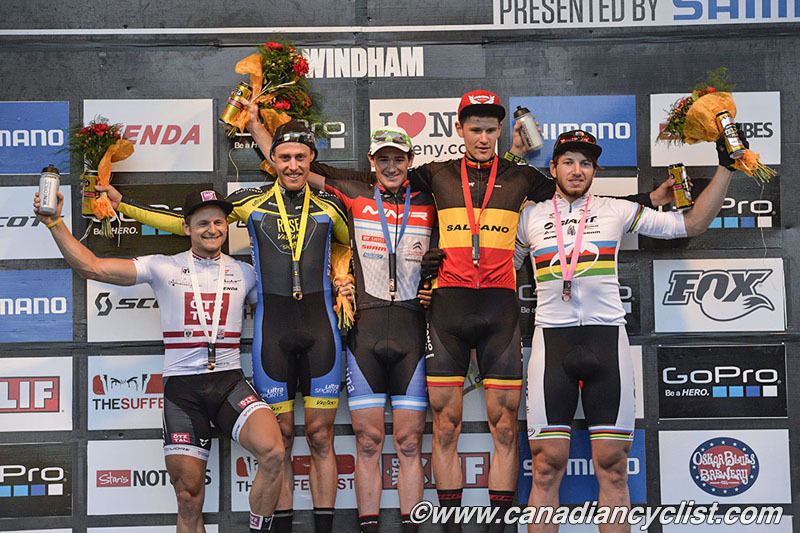 National champion Léandre Bouchard (Cyclone d'Alma/Devinci) was in a good position until world champion Paul van der Ploeg (Giant) turned the tables on him. "I had a good start and was second after the first turn. I tried to stay calm and surprise the leader after the climb, but in the end it was the world champion who surprised me. I tried to pass on the downhill but I was unable to do it, and lost my spot for the quarter-finals." Mels has extended his lead in the overall standings over world champion Paul van der Ploeg of Australia, and now has 157 points to van der Ploeg's 138, with Federspiel in third at 130 points. - Rissveds nearly crashed in her semi-final heat. "It was a bit sketchy. I just went too fast in that corner and almost crashed but didn't. I could get going on the bike again and save a spot in the final." - A false start in Tremblay's heat was caused by a person who wasn't even racing. With only three riders in the heat, a cameraman was standing in the empty start gate, and inadvertently broke the timing beam a fraction of a second before the racers departed. A quick whistle stopped the race and they did it all over again, without the cameraman in the start gate. 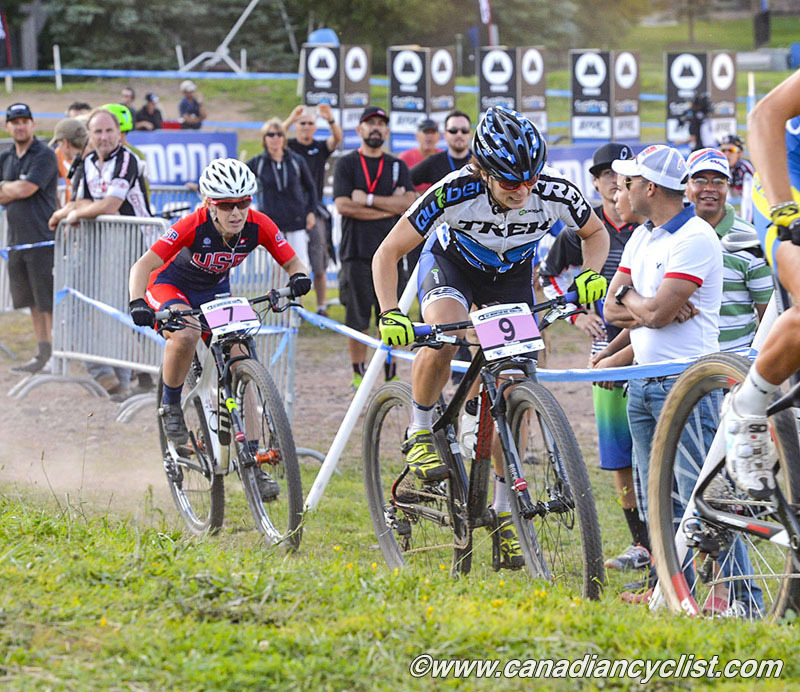 - Canadian National team coach Dan Proulx was able to see the positives in the men's results: "We always look at this race as a learning process. It's an event we use just to prepare for the cross-country. It gives the legs a good test and prepares the mindset for the rest of the weekend. It's always disappointing when you get eliminated early, but this is the game of cycling. The rounds these guys were racing were extremely competitive. Ultimately it's good preparation for Sunday." - World champion Paul van der Ploeg surprised himself with his performance: "I had zero confidence after the time trial. I was 21st, over 10 seconds back from Soto, who ended up winning. For me, it was just about having good tactics, and my tactic was good. Like you see in the final, Gegenheimer and Soto were the fastest two out there and I was knocked out by them in the semis. I was a bit annoyed because the guy in front of me sat up in the semi-final when I was ready to make my move, and by the time I got around him he'd left a big gap to the other two and I had no chance to get around. Just gave what I had in the small final and I managed to win that so I'm really happy." "I think I would have to win and the other boys would have to stuff up in the final race [in order to win the overall]. This course was probably the polar opposite of what I needed for a good sprint course. I usually like the faster ones with a long finish straight where you can have a big kick like in Albstadt [Germany]. Look, you have to be good on all courses to be successful so it was a pretty good result in the end."